Back in the day I used to skip blusher and head straight to bronzer, but recently I've been filling my Muji storage with a variety of shades ready for the up and coming months. For me, like many others, I find it hard finding the right shade for my skin tone, but after expanding my collection and experimenting with shades ranging from bright corals to light pinks, I have now narrowed down my top three high end blushers that I'm going to share with you today. MAC Blush - Margin | £18 | Link | If you're looking to invest in your first high end blusher, MAC is the perfect place to start. Ranging from bright pinks to corals, they've got all the shades covered. 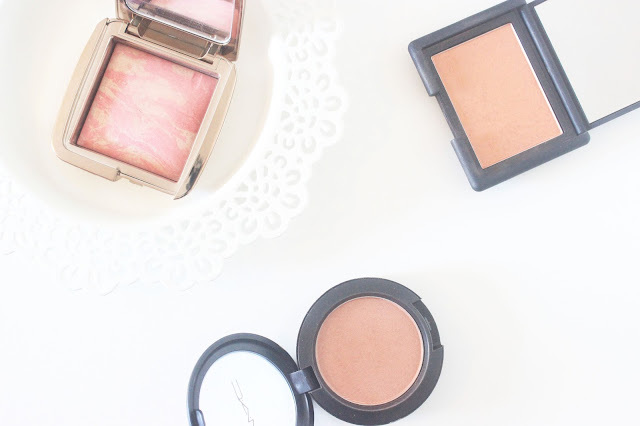 For me, my go-to MAC Blush is Margin, perfect for when you've got a tan and want to leave a light sheen to the cheeks. The brown hued peach suits all skin tones and adds a light flush of colour to the skin. Nars Blush - Luster | £23 | Link | It was back in April when I first mentioned this blusher and since then I've been wearing it pretty much every day. This golden, peached hued shade is perfect for the Spring and Summer months. Rather than being a heavy shimmer like the shade in the pan would suggest, it actually transfers onto the skin as a sheer, buildable coral that looks perfect when contrasted with a tan. Adding a slight bronze to the skin it helps to accentuate the cheekbones and give a healthy glow to the skin. Hourglass Ambient Lighting Blush - Luminious Flush | £28 | Link | If you haven't heard of the Hourglass blushers then I don't know where you've been hiding. The gun metal exterior and baked style blushers have been all over blogs since their release. Whilst helping to exhibit depth and definition to the cheeks, the lightweight powder delivers a soft focus colour and radiant finish. Luminious Flush is described as a champagne rose blush and due to the finely miled formula, if you're looking for a natural flush of colour then I would recommend looking into this one. Even though the price tag may make you gulp, the long wearing, seamless colour will make all the pennies worth while. What are your favourite high end blushers? I used to be the same! I was like no don't need blush my cheeks are red enough and now I can't get enough! I would love to try the hourglass blushes! I need margin in my life! I totally agree with you about hourglass blushes, they're sooo lovely but pricey!